Brightly colored oil sticks lay ready on my desk next to a big blank sheet of paper. I hadn’t painted since I was a child. I never expected to be doing it in graduate school—until I signed up for a class called Art Therapy and Dreams. I was studying at Lesley University to become an expressive therapist for kids who had a hard time talking about their feelings, usually kids who had been emotionally or physically abused. The different art forms—drawing and painting, dance and drama—gave them ways to communicate and process their experiences. In order to really un-derstand how this therapy worked, I had to try it myself. I stared at the blank paper. Drawing didn’t come naturally to me. I picked up a green oil stick and streaked it across the paper. I made loops and circles with green and red. I grabbed a new sheet and started again. Bright green and purple covered the page, and I added a little blue house up in the corner. I stopped drawing. Where had I seen a blue house like that before? In a dream! The memory came back in a rush. I was five. My mother had just been diagnosed with multiple sclerosis. She told me not to worry, but I did. Was Mom going to die? Then one night I had a dream. I was walking down our driveway. An angel waited for me at the end. He scooped me up in his enormous wings. He was glorious! He cradled me in his strong arms as we flew into the sky. Up, up, past the moon and the clouds until we came to a little blue house amid the stars. Suddenly I was inside it! And I was no longer afraid. The walls protected me just like the strong arms of the angel. Inside my star house I felt loved and cared for, completely and forever. I felt strong. That dream became my refuge. No matter how I worried during the day, at night I found comfort in my star house. Finally, I could see that Mom was going to be okay; her disease was under control. I forgot all about my star house—until that day in my art therapy class when it popped out in my painting. I felt a rush of comfort and strength, just like in my dreams as a child. “Now you can see the power of art and dreams,” the instructor said when I explained my picture. The star house became an important part of my master’s thesis. Now that it was back in my life, I didn’t want to let go of the feeling it gave me—even after all these years. I hoped it would help me teach other children how to find such strength within themselves. After graduating I had a chance to put my skills to work with children on psychiatric wards. We celebrated when a child healed enough to leave the hospital. We also knew the harsh reality. For too many the struggle was far from over. It was a big step going from a safe, structured environment into an unpredictable world. “It’s so frustrating,” I said to another therapist one day. “These kids need a place where they can transition at their own pace.” The words had barely left my mouth when a thought came to me: Why don’t you make a place for them? That night I lay in bed thinking about my star house. Every child deserved what it had given me: a feeling of being loved and protected. But I had had an angel to carry me there on his wings. I didn’t have wings. Could I help other children anyway? God, I thought, I felt your loving protection in my dream. I want these children to know that feeling too. Help me find a way. The next day I called a friend who was the director of a group home in Beverly, Mass., which was not far from where I lived. “That’s quite an undertaking,” he said when I told him the idea. My friend made good on his promise. We formed a dedicated board of directors, wrote a mission statement with program policies, and developed a business plan. Star House became a non-profit corporation. Then the Office of Community Development gave us a grant to buy ourselves a house. I began hunting with a real estate agent. Months went by. I saw house after house with no luck. The few times we did bid, we lost. “It’s hopeless,” I told the agent after another afternoon of searching. A few days later we were driving up a narrow driveway. I looked out the car window at a cheerful blue colonial house, much like the one I had drawn with my oil stick. I opened the car door and got out slowly. Could this be the house for us? I stepped onto the sidewalk. An in-viting path led from the front door right to my feet—and what was that on the ground where I stood? 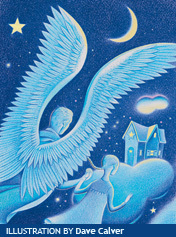 A bright blue star drawn in colored chalk. Not only just right. More like just perfect. Could there be any doubt we had found our house? After a quick tour inside, we sealed the deal. Today Star House has six children in residence, aged five to 12. They go to school, play games, have picnics, make friends and get the intensive therapy they need. When they’re strong enough they will move on to live with families of their own. But even after they move on, I hope they carry Star House with them, just as I have for so many years. Star House isn’t four walls and a roof, or the furniture or toys donated by the community. The real Star House is a safe place where everyone feels God’s love and protection. I thought my angel had built it just for me, but God made the house. All children are welcome there. You are currently browsing the archives for the Spiritual Experiences category.